Today we had to bid farewell to the luxurious Gordon Guest House. Among the joys of the house were the two USB ports in the bedroom, which Martin later told us had been recommended by the tourist board and were usually found only at 5-star hotels. May everyone get on this bandwagon! So much easier than hassling with the adaptors that never work as expected. 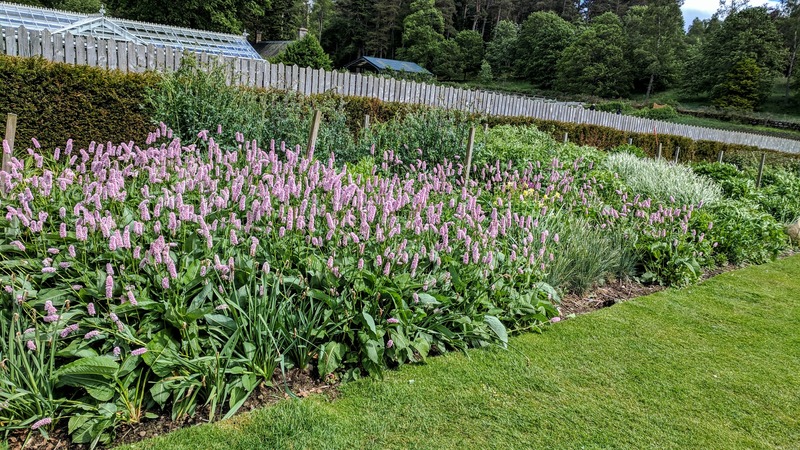 We had our last delicious breakfast and bid farewell to our hosts, hopped in the car and headed for Crathes Castle and its garden on the way to the airport. As we drove in, we saw women encasing the trees in knitted and crocheted designs – yarnbombing strikes again! Since the rain was holding off for the moment, we decided to start with the gardens. Wow. 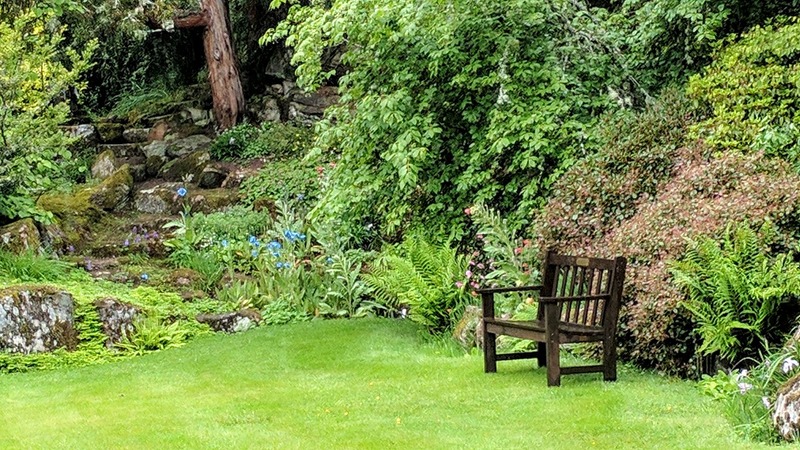 In the 1920s and 30s Lord and Lady Burnett (we never did figure out the family) expanded the existing gardens to make four garden rooms and a series of gorgeous borders in the Arts and Crafts style. After a very dry spring – everyone kept telling us that the past month had been nothing but sunny and delightful but too dry – they had a ton of rain in two days (note the sign). So everything was cool and drippy and gorgeous. Close to the castle is this room, featuring topiary and a perfect green lawn. Close-up of the topiary here: We started by looking at the white border, and here is a closeup of the delphiniums. At the focal point where four paths meet is this ancient tree, then the June border that was in its glory. These lupins are a bit stiff and overdone compared to the wild ones in Maine, but they do make a show. 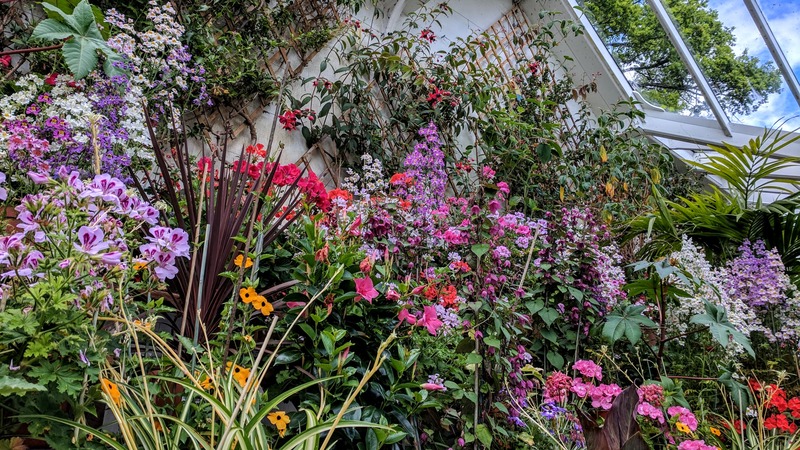 Many of the cottage garden flowers in this border are no longer commercially available, making the border that much more important. I was especially struck by the way they stake the plants, using what one of the gardeners told me was fishing nets though of a good thickness, unlike the black netting we get that does nothing but tangle. 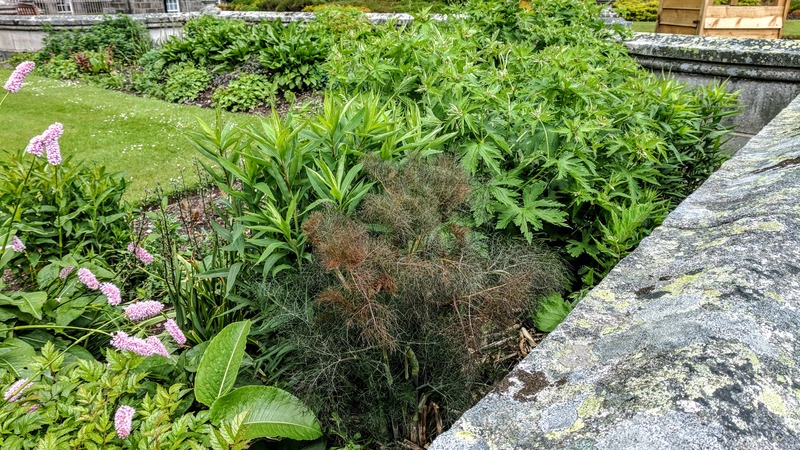 If you have a great swath of plants, it’s a good solution. From here we scurried through the water garden, croquet lawn, red garden, gold and green garden. All beautiful, even those that were clearly not yet at their full summer glory. It certainly helps to have weathered stone walls and perfect edging. An old “dovecoo” makes another focal point. This really was one of my favorite gardens, quite traditional but quite stunning. So here are even more pictures of this amazing place. After this, on to the castle. Unfortunately we ran into a large group of French tourists with a very loud leader, so we had to make our way through the first several rooms without looking at them in order to get ahead of the humanity. 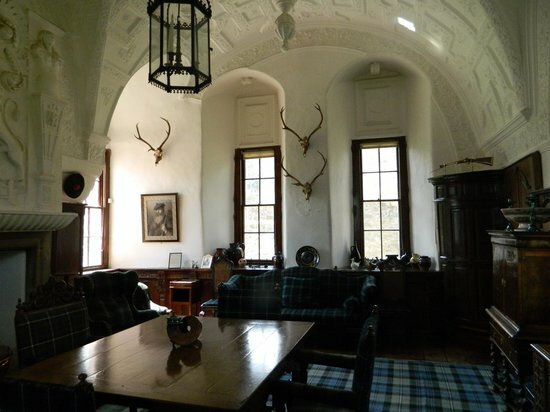 When we did find our way into the house, we appreciated the horn of Leys given to the family by Robert the Bruce and hung over the fireplace, the painted ceilings (reminiscent of the John Knox house in Edinburgh) and some of the textiles. The first image is crazy quilt chair seats (! ), the second might be applique, the last might be stumpwork . 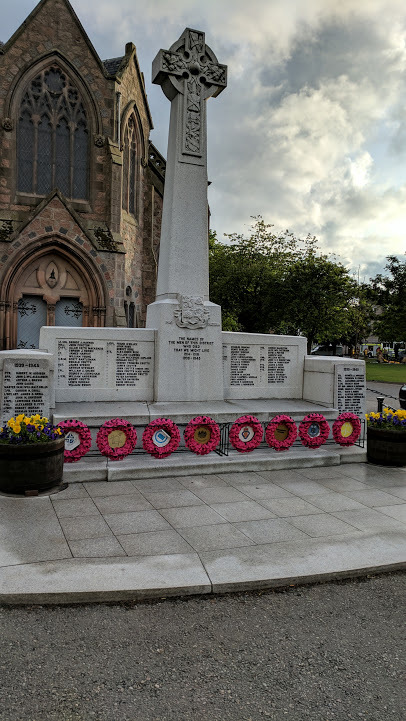 But we never did connect with the family in the way we did at Craigievar. We were also aware of needing to get on the road, so we gave them short shrift. After a quick lunch in the castle cafe (and a tantalizing visit to the garden shop), we were on the road with the Vauxhall for the last time. Again the satnav took us on back roads – if only getting to Dulles were this scenic – but we got there in good time. A bit of confusion finding the rental car return caused a nice policeman to stop us, but he soon realized we were in need of help and he directed us back the right way. We had a while to wait for the plane to Kirkwall, but at last we were boarding a small plane, quickly flying above the clouds, and just as quickly, and unexpectedly, hitting the ground again. Kirkwall is flat, wet, and cloudy so far. The brisk rental car man directed us to our little Ford Fiesta (such a comedown from the Vauxhall! ), and we were on our way to the hotel. The Orkney Hotel has several virtues: hot showers, strong coffee, and a central location. 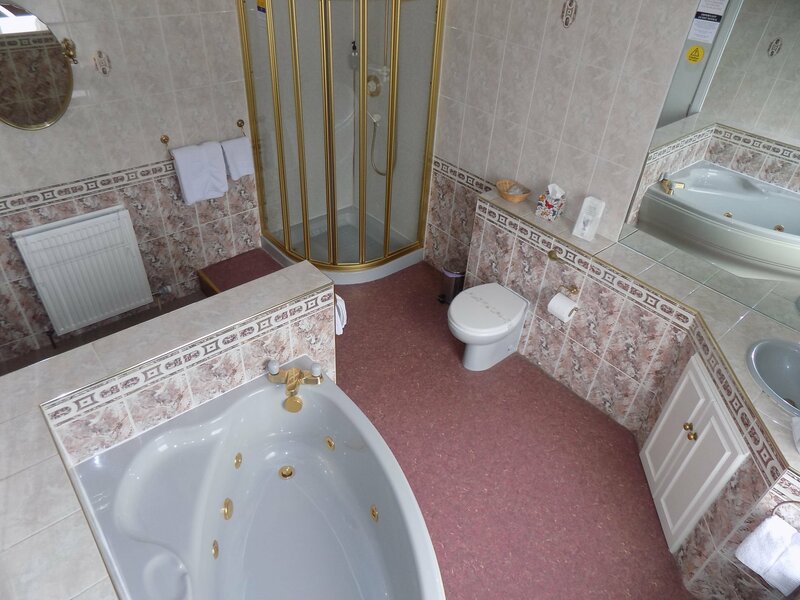 On the other hand, the bathroom is out of the 1960s complete with a yellowish light on a string over the bathroom sink, and a pervasive smell of damp or at least mustiness. But here we are, and it was not so bad (just compared to the Gordon guest house!). But there is much to explore in Orkney. Onward! Thursday was our free day to walk and we spent quite some time determining which walk to do. 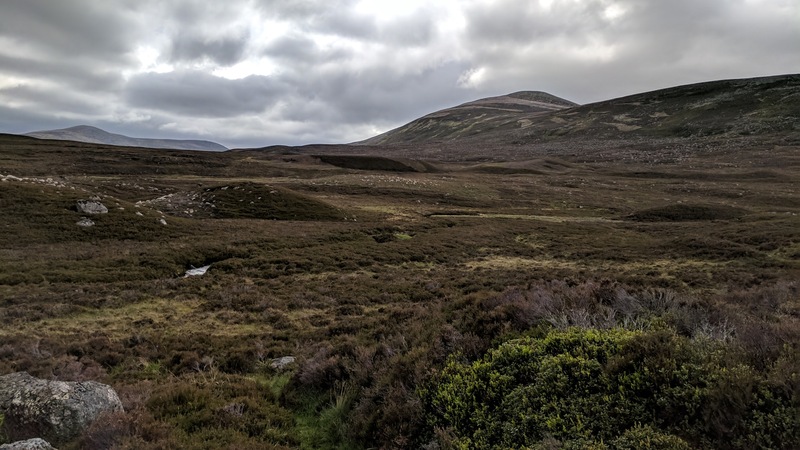 An out and back at Loch Muick (pronounced Mick) on the Balmoral estate? A walk up behind Crathie Church? 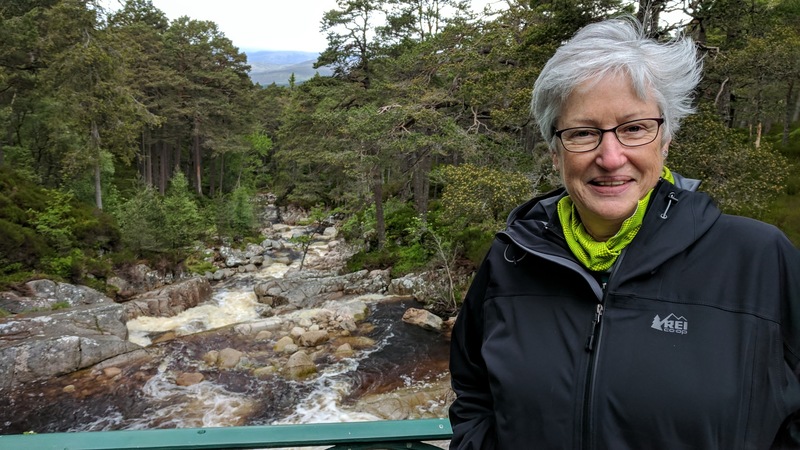 Around Ballater? 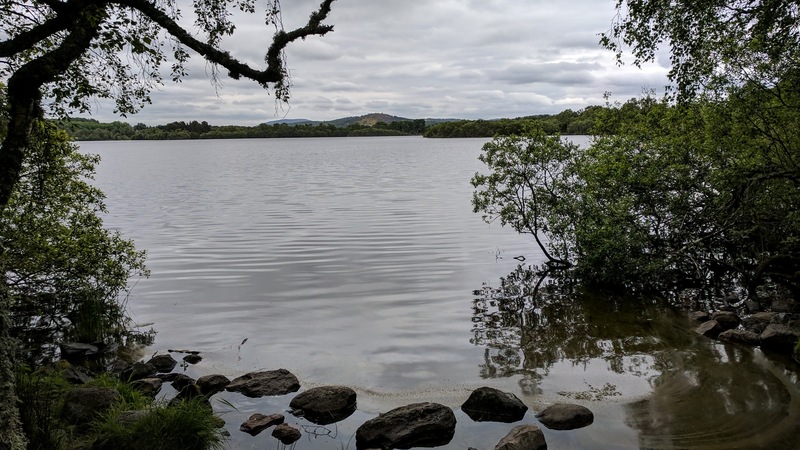 At breakfast it came to me: we would do the Muir of Dinnet walk around the loch, flat, 3.7 miles, pretty straightforward. Amanda, Martin’s wife, cheerfully seconded the idea and we were off. Clouds were lowering but it was not raining when we set off from the visitors center on the signposted Duck path that goes around the loch. Along the trail was what I gradually realized was bracken. 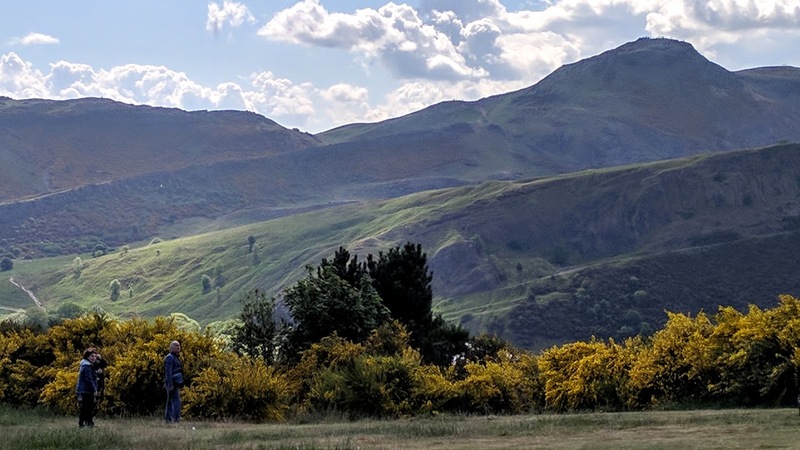 (On this trip I’ve seen bracken, gorse, monkey puzzle trees, a Vauxhall (the car we rented in Aberdeen), a railway embankment, rooks (heard them, too), and who knows what else from every English book I’ve ever read.) There were lovely views, too. 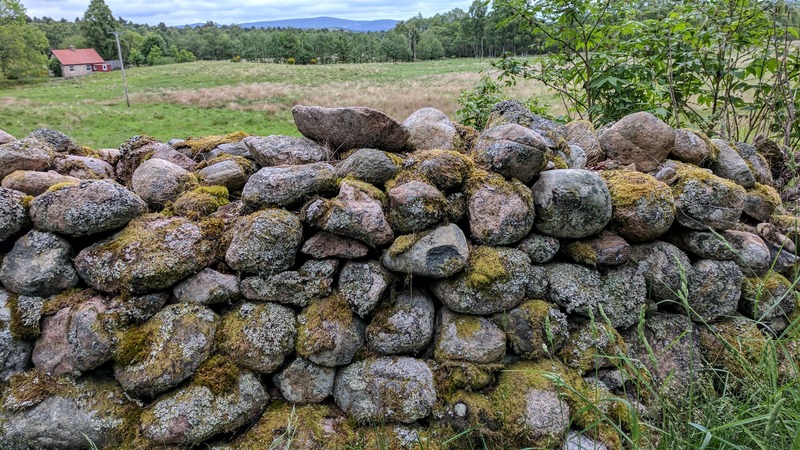 stone walls made of rounded stones, and, unrecorded by camera, hares in a field, and birds on a stone wall in that same field that I think were lapwings, I could see a plume on their heads and they seemed to be black and white primarily. 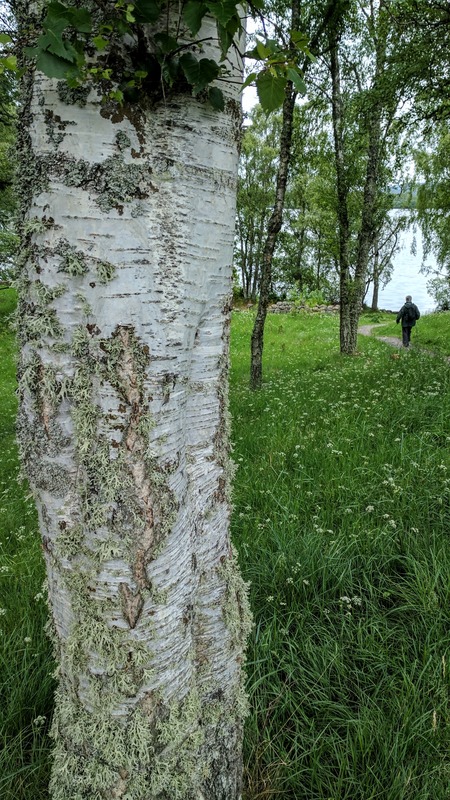 We followed the path around and around the loch, seeming never to get closer to the end. 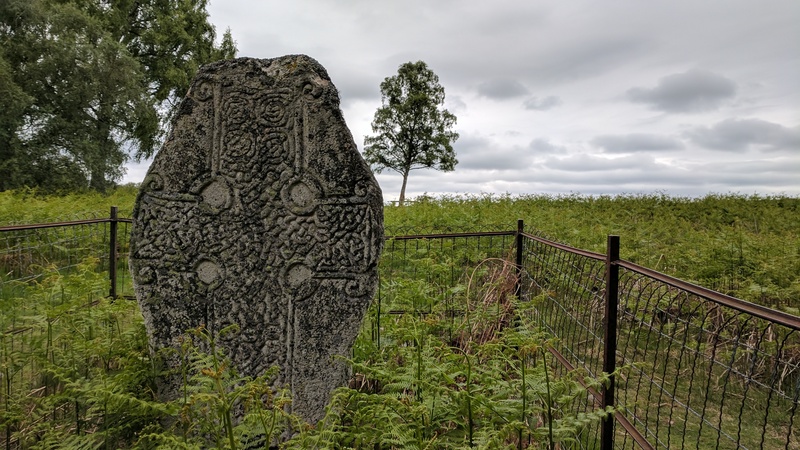 I was looking out for the Pictish cross and we finally found it, quietly impressive partway up a field. 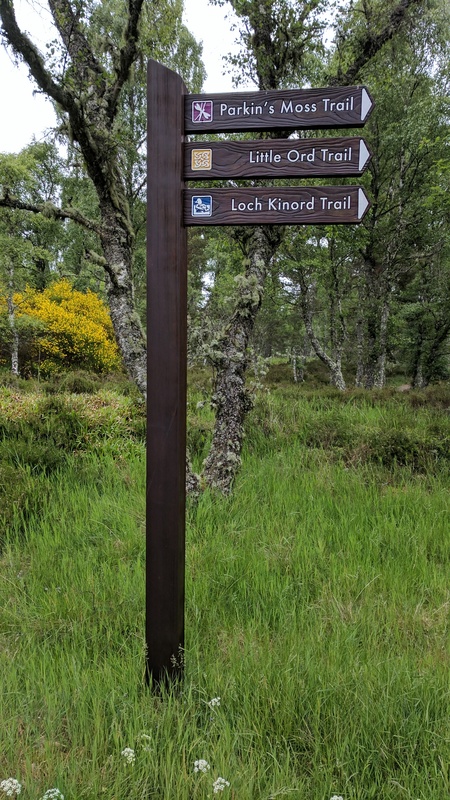 I was sure that the path continued below, along the banks of the loch, so off we went. The path became stonier and more boggy as we picked our way along, and we finally came to a broken down fence and thought, this is wrong. Looking more carefully at the map we realized that we should have walked up the hill above the cross, so we retraced our steps and found ourselves on a wide path next to a field (where we saw the hares and lapwings). 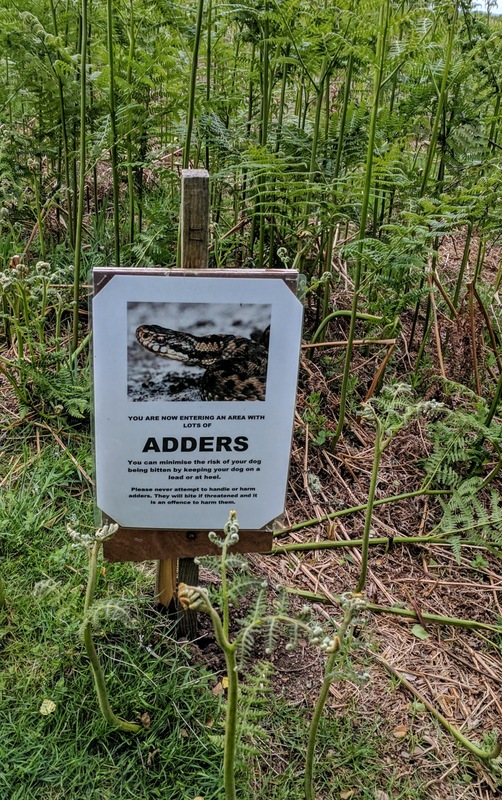 As we came to the end of the field, there was a danger sign about ADDERS, the only poisonous snake in Scotland. This has got to be one of the best danger signs we’ve seen over the years. Of course, by the time we saw the sign, we had already walked through the danger! On and on we trudged, and although it was lovely it was also the longest 3.7 miles I’ve ever walked. Just at the end it began to sprinkle, so our timing was perfect. Back at the visitor center, we hopped into the car and drove to the Loch Kinard Hotel not far away. 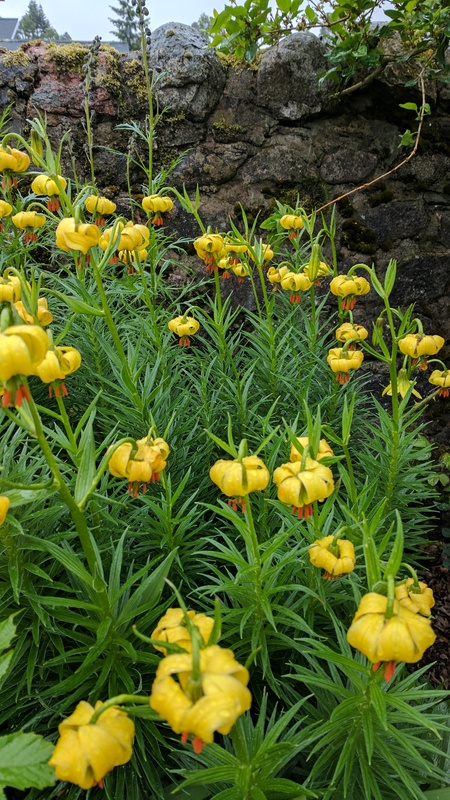 A quick peek at the garden revealed these cheerful lilies blooming in the rain. Inside we had the soup of the day – leek and potato – and shared a cheddar and chutney panino. Very warm and comforting as the rain began to pelt down outside. Home to the room with its jacuzzi, which we both thought was nice but something we would never use. Well, guess again – we both enjoyed taking hot baths and having the jets swirl about our aching legs. Perfect! Today was Balmoral day! 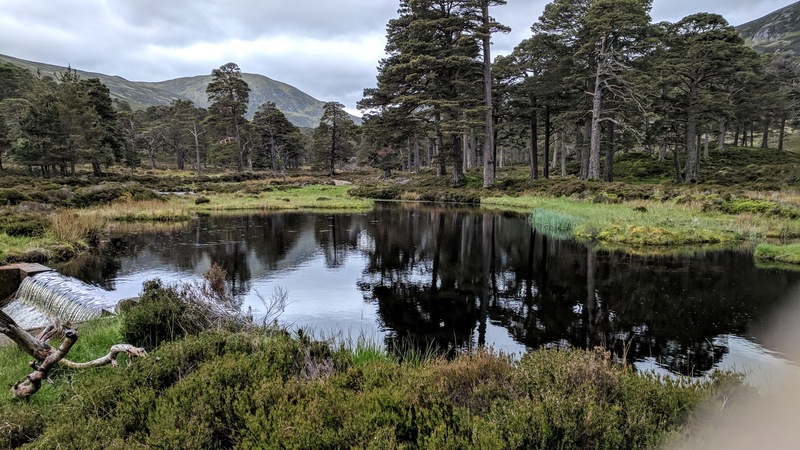 (I know, this is all out of order and I never did catch up to last summer’s Scotland trip, but better late than never.) Luckily there was only a drizzle here and there and by the end of the afternoon there was blue sky and sunshine. We booked a “safari” on the estate in a Range Rover with a real ranger. It was worth every penny, truly a highlight. George, our guide for the five of us, was very entertaining. Here he is explaining about stags and their antlers. You’ll have to excuse the noise from the car engine, but at least you can get a bit of his accent. Clearly he (a 19-year veteran of the castle) has a high regard for the Queen and Prince Philip. (He did mutter that no one likes Prince Andrew.) 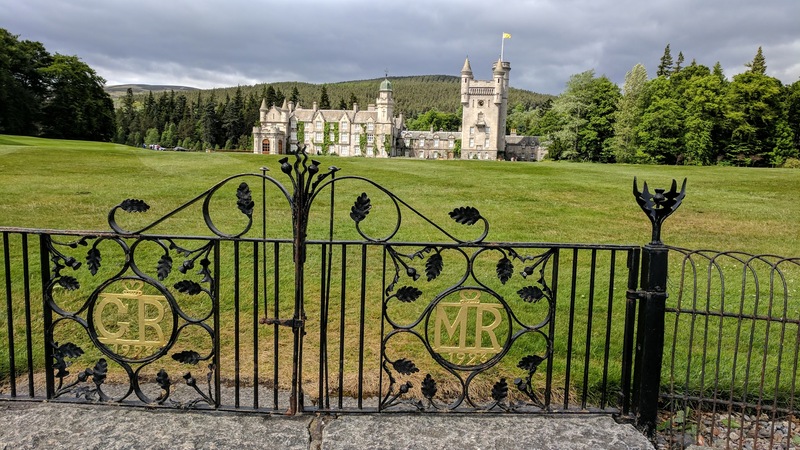 He emphasized how the royals like to relax at Balmoral and that the queen and one of her people like to work together to scrub down one of the houses on the estate at the end of the season. 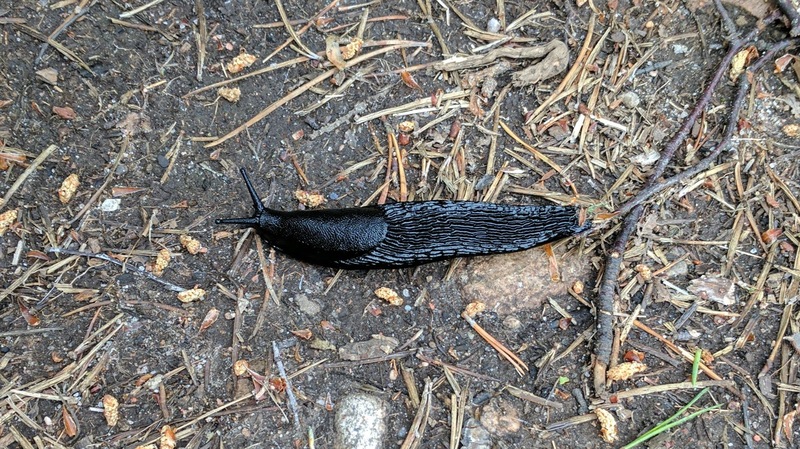 During the high season, July through early September, they all live in the castle. But when they come up for a weekend or a couple of weeks, they stay in a house that is smaller and more manageable. The takeaway message is that it’s easy and comfortable for them while they are there. He traversed, as he said, only a corner of the estate, but we saw a great variety of habitats. Roe deer, red deer, moors, heather, Scots pines, highland cattle, stags, but sadly no capercaillies or red squirrels. Here are a few glimpses of what we saw. 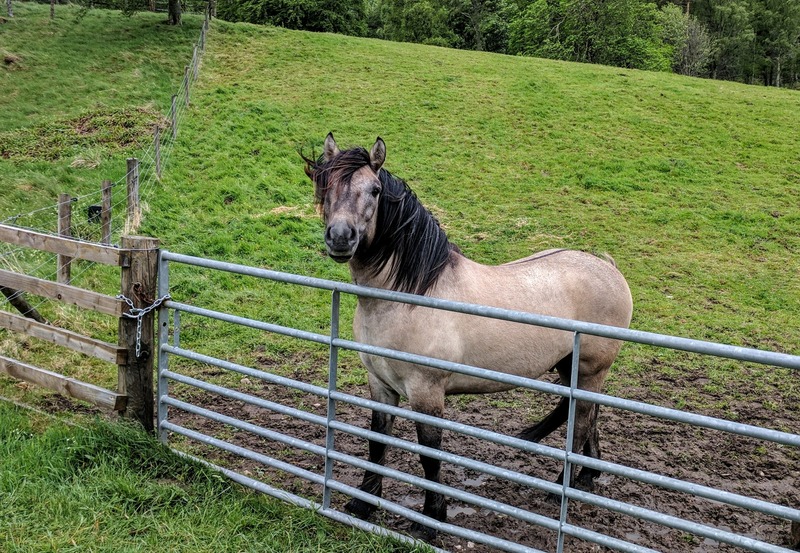 Scottish highland ponies are big at Balmoral. We saw several as we traversed the grounds. Here’s a close-up view of the special dorsal stripe typical of this variety. 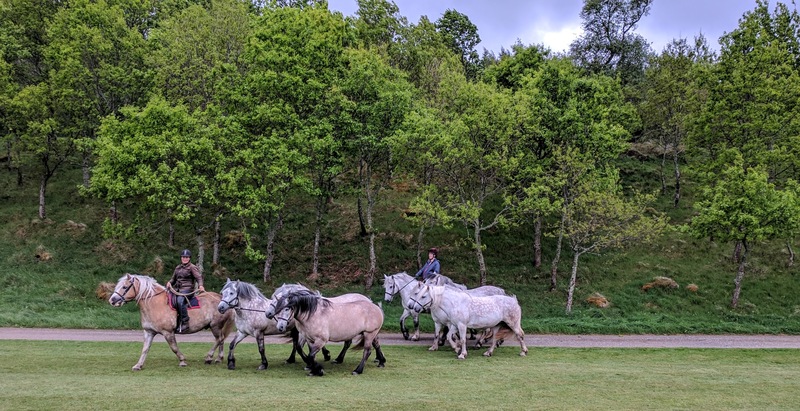 And here are some trainers taking the ponies for a constitutional. We stopped at one point and walked a path up to a waterfall, a route often taken by Queen Victoria. 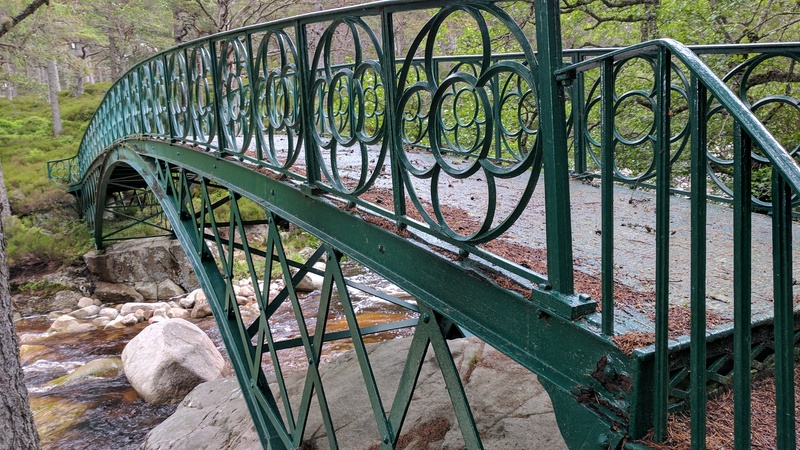 Here I am at the waterfall, and here is the bridge she had made over it. We stopped to see the Finnish cottage, described by CNN as the “Honka Hut (a pine summer cottage that was a gift from the Finnish government and is one of the queen’s favorite spots on the estate.” But who should pull up but – not the royals, rather three cars of local police. 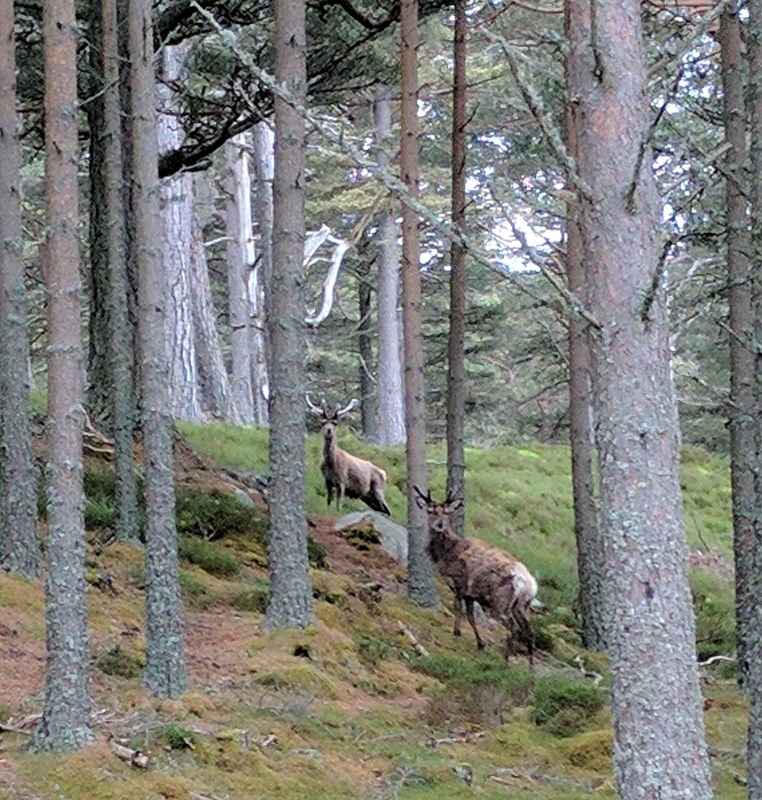 They were quite friendly and showed us a photo they’d just taken of a stag. 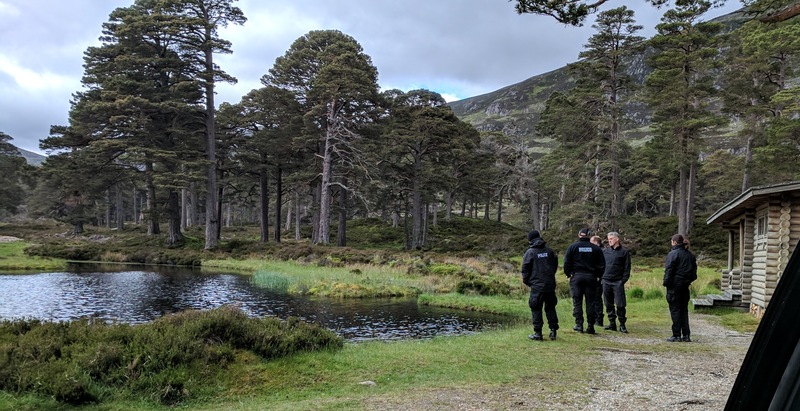 George advised us that some royals might be coming up for the weekend and that the police were likely doing a recce in advance. We never did see any royals, but it was fun to think that we might. After the safari we toured the castle, which means only that they let you see the ballroom with several exhibits of Landseer portraits, regalia, and photos of the family (no photos allowed, sorry). Then on to the gardens: a glasshouse with plants arrayed on wooden shelves in such abundance that the shelves are invisible. 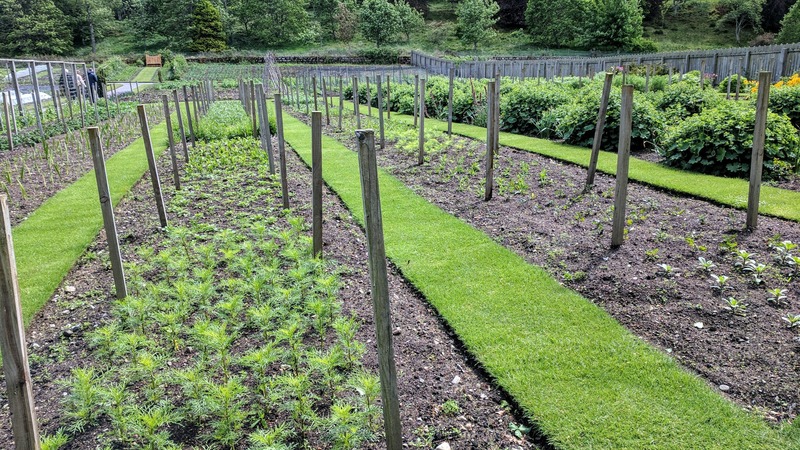 Extensive vegetable gardens that feed the estate, all planned to peak during July and August when the Queen is in residence. Lovely cutting gardens, these featuring flowers I love and can never remember the name of, there is also a red variety. It will come to me. And here it is in a border. I love it! I don’t know if this bronze fennel is intentional or if, like me, they find it self-sows everywhere and let it have its head. Oh, to be a gardener there! Today began with a gentle but relentless rain that did not let up all day long. Luckily, it was not too cold so we put on our rain pants and went on undaunted. 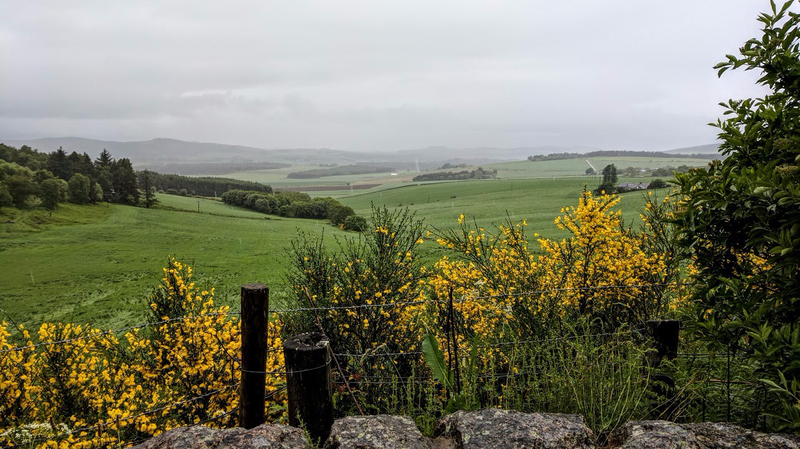 After a look at the River Dee, just down the street from our guest house, we drove first to Craigievar Castle, stopping on the way to see the Howe of Cromar, a patchwork of countryside, from a roadside layby called the Queen’s View. Even (or especially) with the mist, it’s a quintessentially British view. 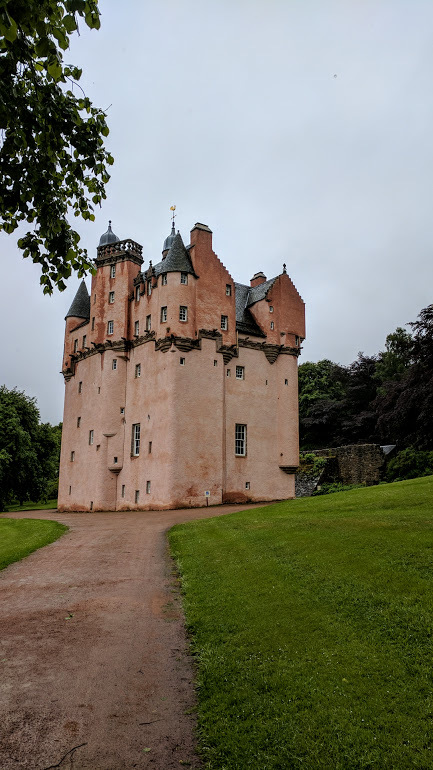 Craigievar Castle proved to be a really good one. It’s made of local pink sandstone and the turrets are said to have inspired Walt Disney. It was built by “Danzig Willie,” more properly William Forbes, a trader with Germany and the Baltic states (shades of Niccolo!) in the early seventeenth century and remained in the Forbes-Semple family (again with the Dunnett references!) until 1963. We went from floor to floor up steep winding stone steps (not for the faint of heart or weak of leg). The family used to spend six months a year here despite the lack of plumbing, heating or running waterup, until they gave it to the NTS. They did install a tub on one of the bedroom floors, but since it had to be filled by hand with hot water from an adjacent wood stove, it was still no bed of roses. It was interesting to see the castle without electricity; if it had been any cloudier, it would have been hard to see some of the details. We loved the photo of the three sisters who were the last children to live here, now in their seventies and still visiting annually, but in the photo lively and curly haired children just a few years older than we were then. Having had a substantial breakfast, we settled for tea and a date bar from the little shop. 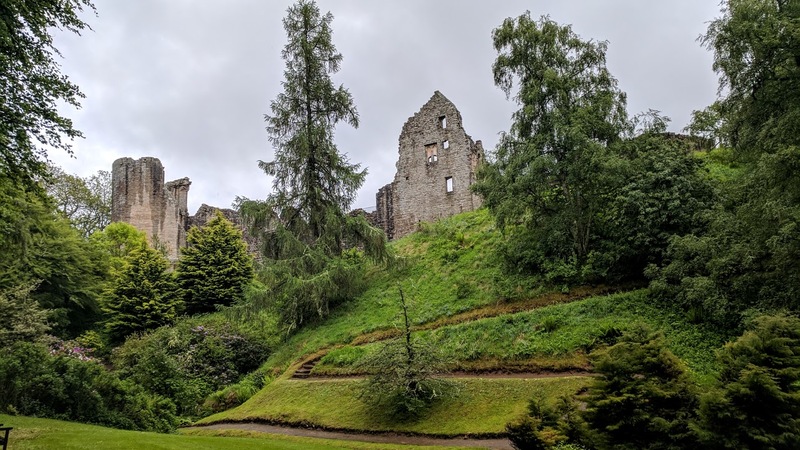 It would have been nice to walk around, but the rain was relentless, so we soldiered on to Kildrummy Gardens and castle. It took a while to get there, again on tiny back roads. The satnav led us astray or at least didn’t correct us at one point, and we had to back and fill on a one-lane road, but we made it at last. The entrance was confusing and we had to leave and start over again, but at last we figured it out. 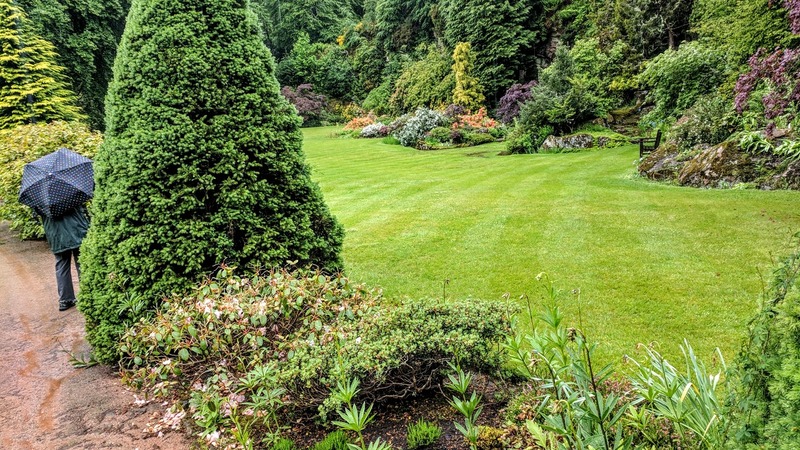 The gardens were designed in the early 1900s on the site of a quarry from which the stone for the neighboring Kildrummy Castle had been taken. It was influenced by Japanese gardens and that’s all I know. 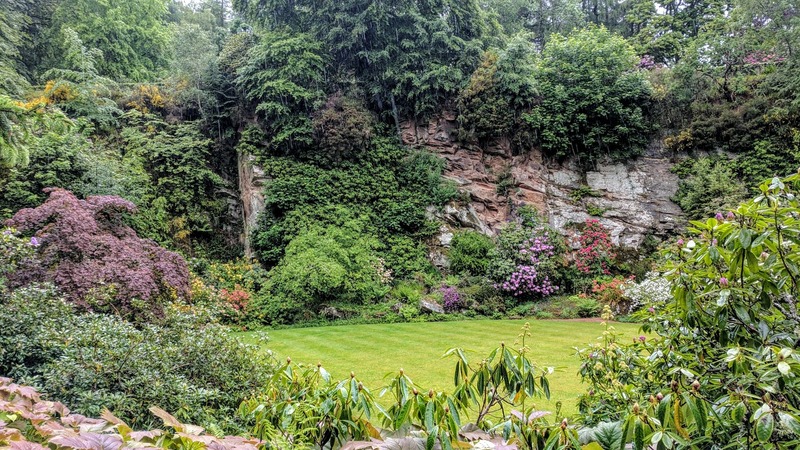 The quarry area was just perfect, the pink stone forming a stunning backdrop for trees, rhododendrons, and perennials (including blue poppies again). It continued to rain gently but relentlessly, as you can see in this video. If you’re suffering in a hot and humid Virginia summer, just play this and you’ll feel better. 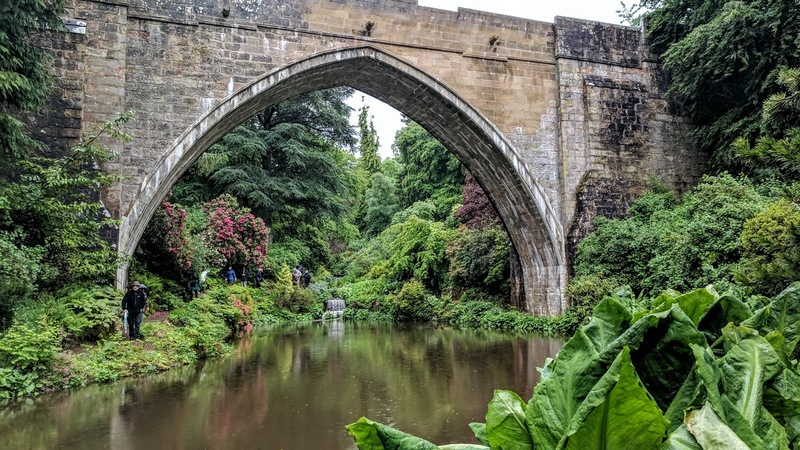 Paths led through the garden to the water area, spanned by a bridge inspired by a thirteenth century bridge in Aberdeen city. We could see the ruins of the castle on the hill above us and decided that that was really all we needed of that. The gentle, persistent rain was actually a great backdrop to it all. Alison was a very good sport, enjoying the bird and squirrel feeders outside the tiny reception/visitor center while I took one more path so I could see the bridge and the water gardens. We both got to see the famous red squirrels, though they were too quick for me to record. 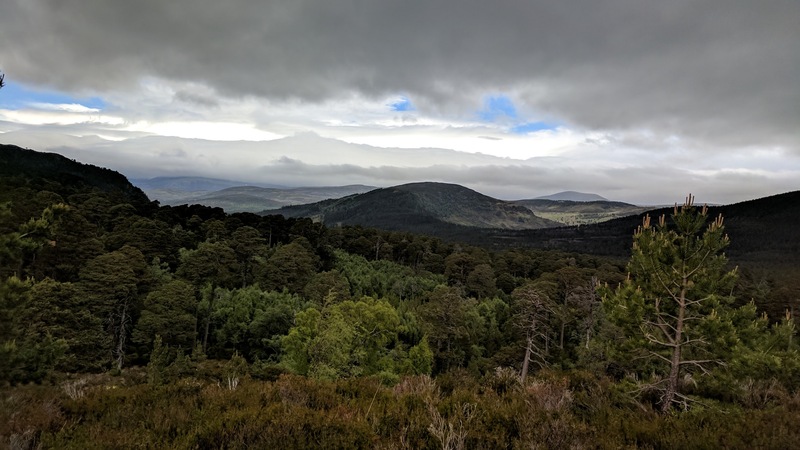 So now we were headed for home, Ballater, following the instructions of the satnav lady. 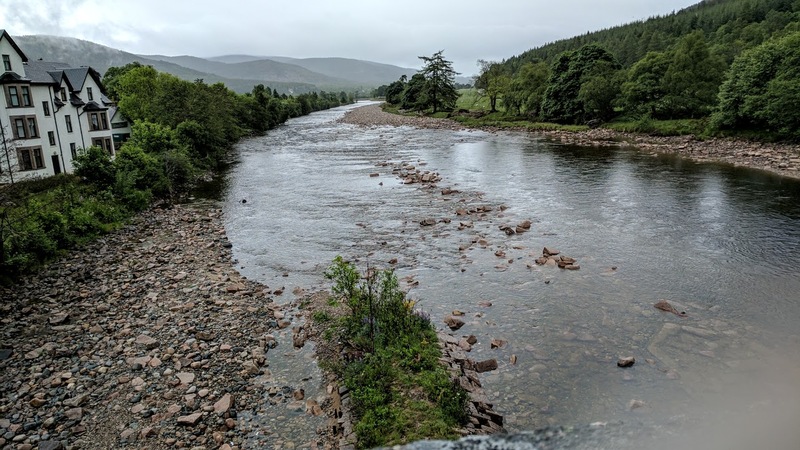 Alison, looking at the map, murmured from time to time that she was taking us on a strange route – “not the way I would have chosen” – but we innocently proceeded, along the River Don, through small villages and eventually on to a bleak, atmospheric moor. I love this country and stopped for a quick photo but AO finds it spooky so we kept going. 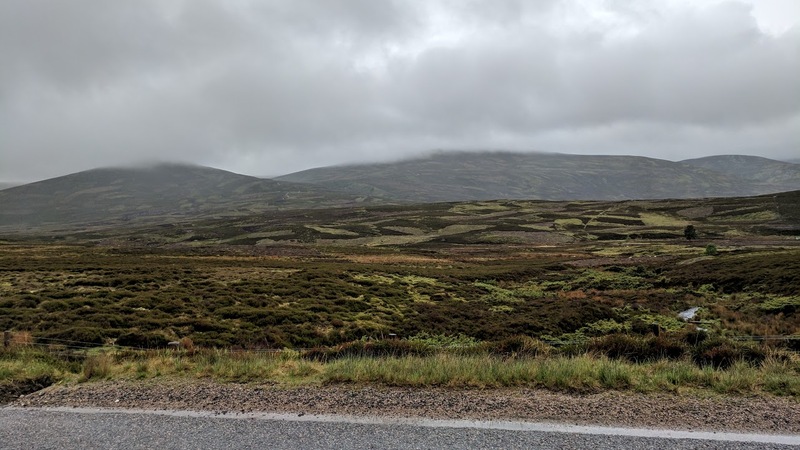 Then, just as the moor was turning back into ordinary green landscape, there was a sign: Caution, 20% grade, showing a vehicle at an alarmingly steep angle. And, it was a blind summit so I couldn’t predict what was facing us once we went over the top. Talk about scary! I hate steep roads anyway, and not to know how steep was alarming. But there was no choice, so I inched along and then could see the hill below. It was very steep, but I did not really think we would tumble upside down if we tried it. Coming up in the opposite lane was a lumbering bus and two cars, one of which darted around the bus just as we were coming down. I said aloud, “This is fine, there’s no problem, it’s going to be okay,” and apparently was convincing enough that Alison believed me. It was only when we were back on a level road that I let out my breath and confessed that I had been scared to death! 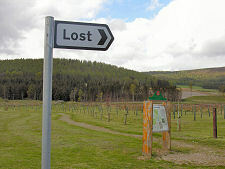 I’m still not sure where we were, but the photo displays as Strathdon. All Wikipedia can tell me is “Strathdon is an informal geographical area. This means that there are no precise boundaries in terms of where it begins or ends. ” So perhaps we were in Brigadoon?? The photo at top is of a village called Lost in Strathdon, so that must have been where we were. Dinner tonight was an indifferent meal at the Alexandra Hotel with the advantage of lots of locals. We had enjoyed the day despite the rain but were happy to lay our heads in our beds. The rental people made sure we had “satnav” and programmed it for us so that we could find our destination (taking care of the old ladies? fine with me!). We edged out onto the highway, which luckily was a very small one, and following the satnav lady managed to turn around and go in the right direction. She navigated us onto the tiniest of back roads, which was perfectly fine with me. 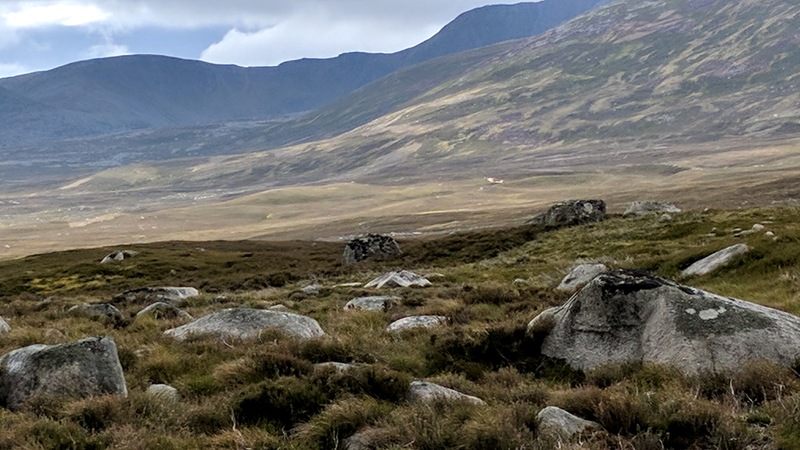 Within a few minutes we were in the land of sheep and fields and those lovely signs that warn, ominously, “oncoming traffic in middle of road.” Following our mantra – look right, look left, stay left – seemed to do the trick. 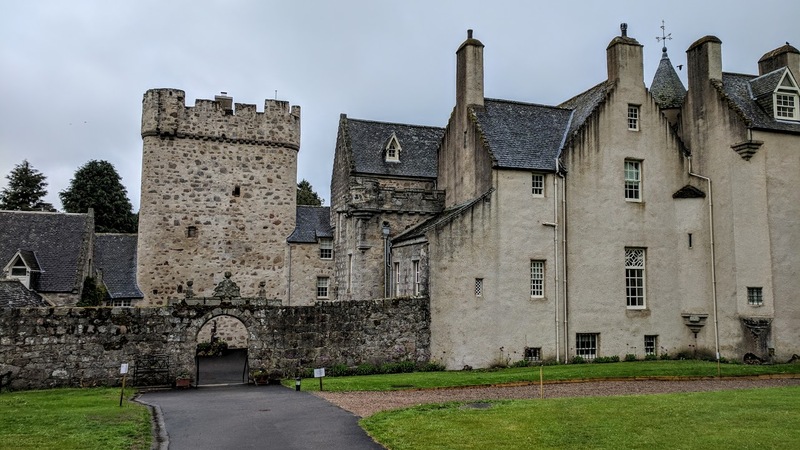 We happened to see the sign for Drum Castle, which was on our list for later, so we impulsively drove down the lane and took the tour. By the time the last owner died in the 1970s, the Irvine-Forbes family had lived here for centuries. (Washington Irving – spelling differs over the centuries – is a member of the family.) 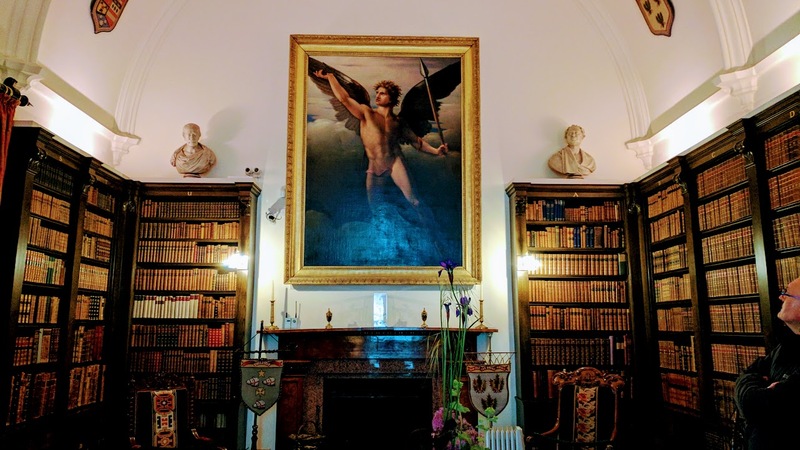 It was quite a surprise, not to say a shock, to his two younger brothers to find that their older brother had donated the castle to the National Trust. But they arranged for a small piece of the land to be nominally theirs, which allowed the title of Laird to go on. I also admired this simple little quilt in the cradle. 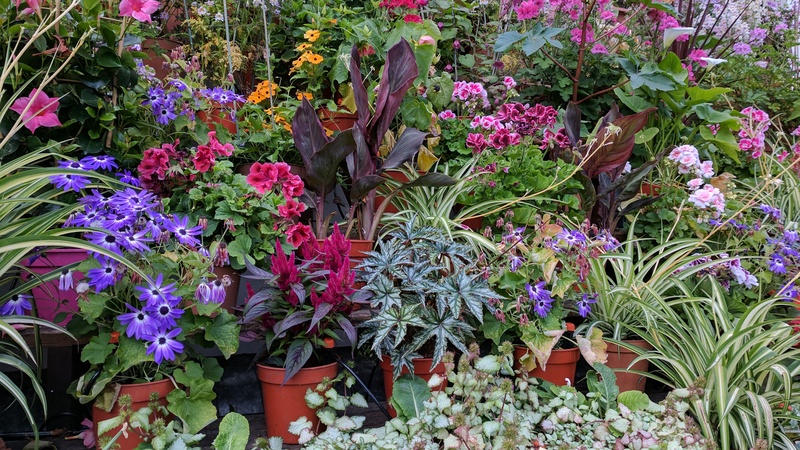 The plant sale in the courtyard tempted me but of course I had to refrain, so here is a trough of succulents instead. Leaving the castle we saw these cattle behind a fence, reaching up to eat the delicious leaves on a tree. If it hadn’t been pouring down rain, we might have followed this elderly couple, quite bent over but still persisting. The grounds include an ancient wood and a formal rose garden, but they must await another visit. We made our way on to Ballater without any trouble and even found a parking space right in the square. The Gordon Guest House has something like eight rooms, with ours looking directly out on the square and up to the hill of Craigendarroch. It has high ceilings and a magnificent bathroom with a jacuzzi (which I doubt we will use but you never know) and proved to be the best accommodation of the entire trip! Here’s a picture of our beds not longer after we arrived. Can you possibly tell who has which bed??? The owner, Martin, is very friendly, with a strong Scottish accent, and happy to offer recommendations about food, drink, drives, walks, and everything we might need. We unpacked and set off for one of his suggestions, India on the Green. (Oddly, our taxi driver in Aberdeen told us that he used to own a restaurant in Ballater but sold it to “the Indians” some time ago. Then someone else told us that the restaurant had closed because of embezzlement by the son of the owner – something complex and bad. Could it be the same one?) Anyway, the restaurant was among the best of our trip so far: serene, delicious, fresh, perfect. I had the Bangla Fish Malai with scallops, and it was divine. This morning we looked out the window at blue skies and decided to go to the Royal Botanic Garden while the weather held. We walked over to the North Bridge and picked up the bus, with a bit of help from the kilt-clad man at the door of the Balmoral Hotel. 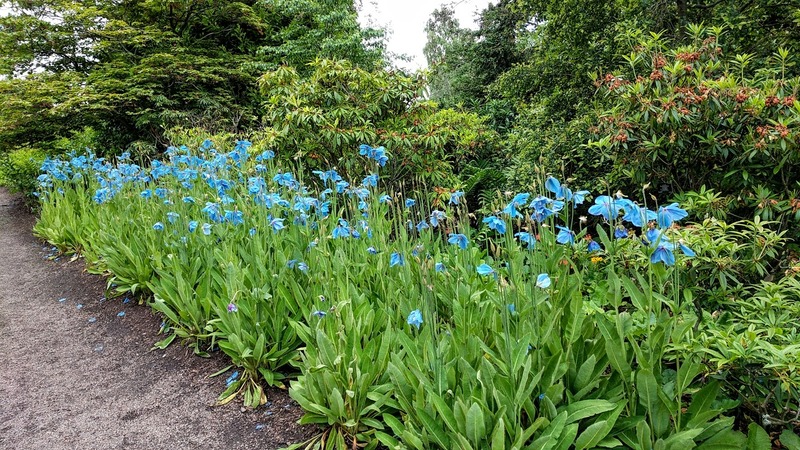 When the ticket taker told us the blue poppies were in bloom, that was all I needed to hear. They have a reputation for being extremely difficult to grow, and because they come from Nepal or China or somewhere I did not expect ever to see them. They were amazing, so blue and so many of them. They were even more enchanting close up. A monkey puzzle tree, just like in books! And a Seussian primula. I wish I could grow these, but they prefer more water than Virginia usually provides. and walked to the bus stop. A very nice young woman with her young daughter helped us to find the right stop to get off at the National Museum of Scotland. Here, fading just a bit, we wanted to see the early people (Neolithics), the Lewis chessmen, and the strange coffins of dolls found on Arthur’s seat in the nineteenth century and never fully explained. We saw them all. The Neolithic stuff was organized by topic so was a bit hard to follow, but we looked for items found on Orkney and found quite a bit. Here, for example, is a comb from the Brough of Birsay, though the majority of items were made of stone. Those who are interested can find more images of objects here by searching for Orkney. The Lewis chessmen were as charming as ever, and the strange little coffins were just as mysterious as ever (though you can find details on what we do know in this article). A quick tea and cake in the cafe and back home again. 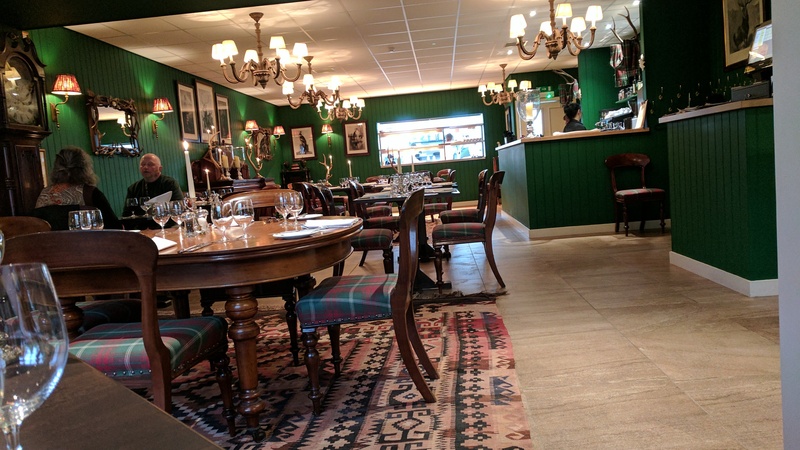 Dinner was next door at Badger, named in honor of the Wind in the WIllows because Kenneth Grahame was born next door at our B&B and they are both capitalizing on this fact. It was nice to come downstairs and just have dinner next door – game pie for me (watch out for pieces of shot!) and cheese plate for dessert – while surrounded by charming badger memorabilia. Then home to pack in prep for leaving tomorrow. On Saturday morning we woke much refreshed to breakfast up on the third floor (lots of stairs in this place), porridge and coffee and poached eggs. 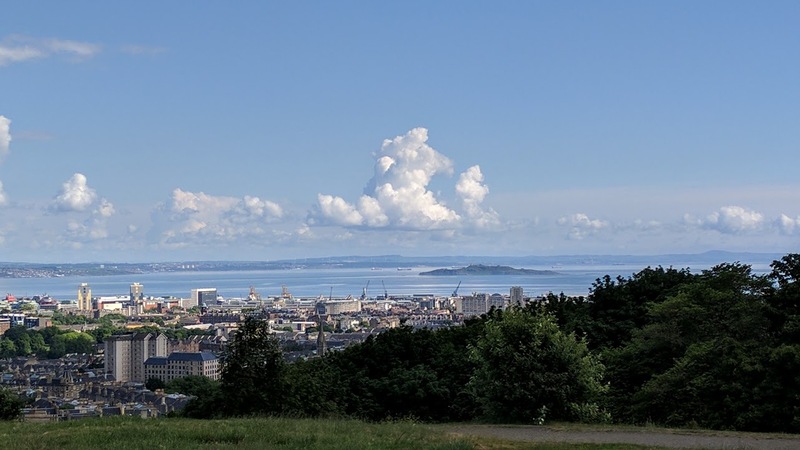 It was a beautiful day despite the prediction of rain, so we decided to walk up Calton Hill. Sun, breezes, and lots of gorgeous clouds accompanied us along Princes Street, past the Scott monument and then up the steps to the top of the hill. An unfinished replica of the Parthenon graces the top. Known as Edinburgh’s Disgrace, it is just one of a number of structures on the hill. Monuments to Nelson, Burns and other worthies are there, too, but you really climb up here for the views. On one side, great views of Arthur’s Seat and the Salisbury Crags, sun and shadow. Then looking counterclockwise, the Firth of Forth with views across the water, looking down on the Georgian buildings of the New Town, where we’re staying, and eventually the skyline of Edinburgh’s Old Town from the Castle down to Holyrood. Back down the hill we took a detour to the Old Calton Burying Ground. David Hume is here in an impressive little temple, but we were also struck by the monument honoring Scottish-American soldiers in our Civil War. We revisited the Thistle Chapel with its charming wood carvings. See the angel playing the bagpipes? We also noted the chapel donated by the Confraternity of the Holy Blood in Bruges. We of course have SEEN the holy blood there. But there was no vial in Edinburgh, so we asked the guide for information. Well! She told us with great animation about St. Giles, a Greek who ended up in a monastery in Provence where he spent much of his time in the forest with his companion, a deer. 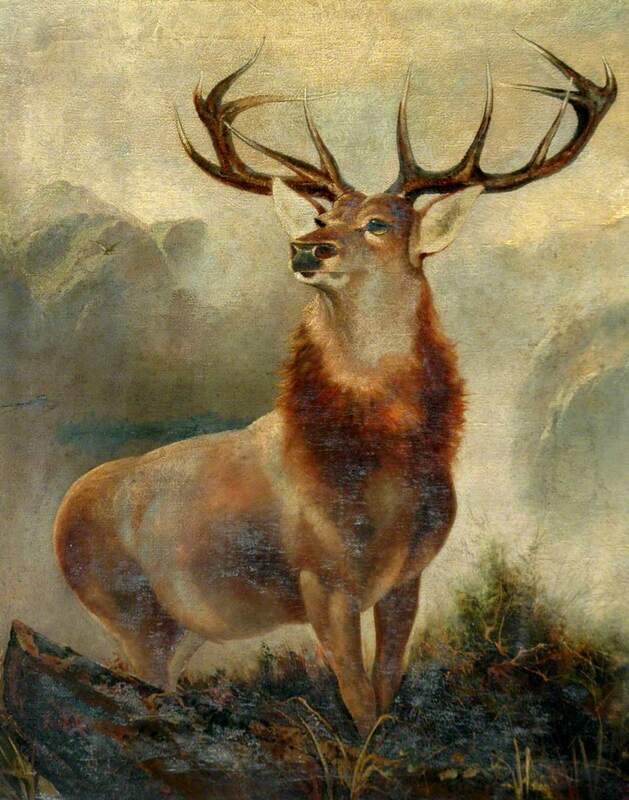 One day hunters came after the deer and St. Giles took the arrow instead (making him the patron saint of “cripples,” says Wikipedia). That’s where the Scottish crusaders found him (or found out about him) and brought the knowledge back to Edinburgh. His arm with a diamond finger ring was donated to the cathedral in the 15th century but was presumably destroyed during the Reformation. (How the holy blood figured in all this we never did find out.) Humbled, we walked over to the stained glass window of Scottish saints and paid homage to St. Giles and his deer. After a bit of mild shopping, we continued down the Royal Mile to the John Knox House, the oldest house in the city with some bits dating to the fifteenth century. Interesting because he and Mary, Queen of Scots, were at odds about religion, but not terribly interesting really. (Though we did see a painted ceiling and little did we know that it would become a recurring theme.) Thanks to someone else for this image, showing the original ceiling and a colorful copy on display. From here, on the advice of the JK staff, we walked to Blackwell’s to find something to read. For me, two from my TBR list: Juliet Nicolson’s “A House full of Daughters” and Joanne Harris’s “Different Class.” A restorative cup of tea (amazing how restorative it is in the UK when I rarely drink tea at home) and a ginger biscuit before heading home. 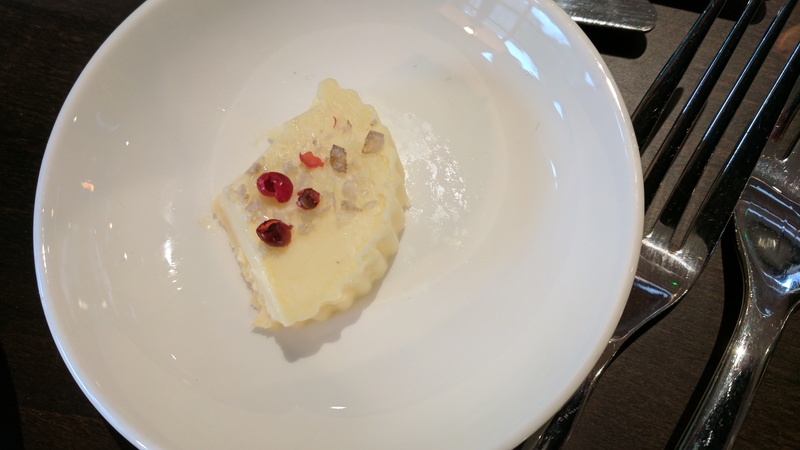 We were weary enough to get a taxi back and, after a rest, we went to Bon Vivant on Thistle Street for dinner. VERY noisy but delicious food, not too much. I had cod with chorizo, red pepper, potato and kale, after a light pea soup topped with creme fraiche, marjoram and crab, and AO had lamb, I think. Followed by a glass of Prosecco and lemon curd (not as good as the rest). Yum. We have a plan (subject to change) to visit the UK every other year, and this was the year. We wanted to go back to Scotland, and after our visits to Neolithic sites in Ireland and Malta, we were interested in more. Plus, Alison has always wanted to see Balmoral, the queen’s summer residence, and visiting times were limited. So it evolved: Edinburgh to revisit museums and St. Giles (Dunnett alert! 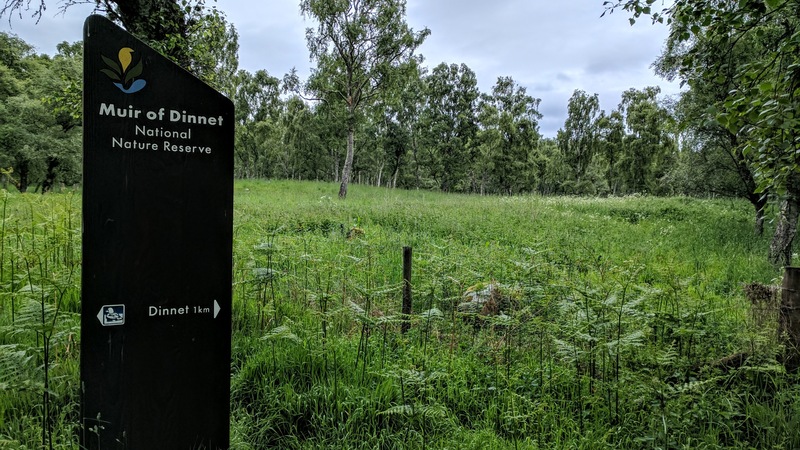 ), Royal Deeside to visit castles and see beautiful country, and Orkney for Neolithic stuff (and more Dunnett). June of 2017, here we go! Our Aer Lingus flight took us to Dublin with an early morning flight on to Edinburgh. We had an empty seat on the way over to Dublin, so we both slept better, but it’s still no fun. On the other hand, you wake up and you’re in Scotland, always a plus. It was cool and rainy when we arrived. We took a taxi to Castle View Guest House, just a few streets over from our old haunt, Frederick House. The entryway was not inviting, with bags of laundry and groceries piled on the stairs. But our room was a good size and the bathroom was modern and spacious. Since we could not check in at 10 a.m. we simply dropped our bags and began walking (stumbling) along the street. We loved revisiting the views of Edinburgh castle and other memories of our previous trip as we walked along Princes Street to the National Gallery. We were drooping but stopped to look at the skating minister and the Stag at Bay Monarch of the Glen, a famous Scottish picture that we had missed last time around. (Thanks, ArtUK.org, for the link). He really is quite magnificent for all that he’s a Scottish cliche. Outside the museum we came upon a piper, touristy but still fun to see (with the Scott monument in the background, just as grimy as ever). We had a quick lunch at the gallery cafe, and finally it was time to go back to the hotel, where we had two hours of sleep before dinner. We defaulted to the Mussel Inn on a busy street on a Friday night. Deep fried whitebait, our starter, luckily turned out to be tiny little fish, eyes still intact, crunchy and delicious, followed by something fishy and washed down with wine. Sitting outside, we watched the light on the grey stone buildings and the people going by. We saw at least two “hen parties” complete with sashes declaring the mother of the bride and the maid of honor, et al. Lots of drinking seems to be involved. We found our way back home and slept like the dead.